This past weekend the Reggie Lewis Center played host to the Coaches Invitational's Large and Small School meets. Considering the time of the season - All State Meet is less than a month away - and the fact that some of our state's top athletes were entered, it didn't surprise us that we witnessed several outstanding performances; not to mention more than a few meet records. Here's what we consider the top efforts from the two days at Reggie. Arlington's Ryan Oosting cruises to meet record of 4:14.98 for mile at Large School meet. Needham's Davonte Burnett breaks MR for 55m dash and 300m at Large School meet. Northampton's Benjamin Gordon-Sniffen blazes to state No. 2 of 2:32.61for 1,000m at Small School meet. Adam Yang of Acton-Boxborough wins 55m hurdles and long jump at Large School meet. In long jump, he set meet record of 23-1.25. 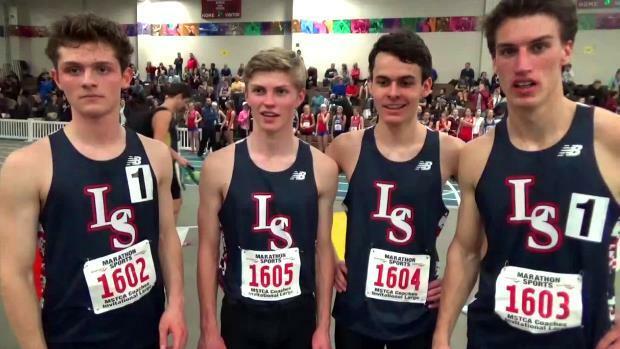 Lincoln-Sudbury breaks MR for 4x800m with time of 7:59.05 at Large School meet. Oakmont's John Caouette takes 55m and 300m at Small School meet. St. John's Prep's Tristan Shelgren dominates two mile at Large School meet, clocking a winning time of 9:18.63. In a close battle last week, St. John's Prep's Tristan Shelgren was our top vote-getter for his second-place finish in the mile at the New Balance Games. Shelgren collected 49 votes. Finishing second with 41 vote was Woburn, which took second in the DMR at the Yale Track Classic.